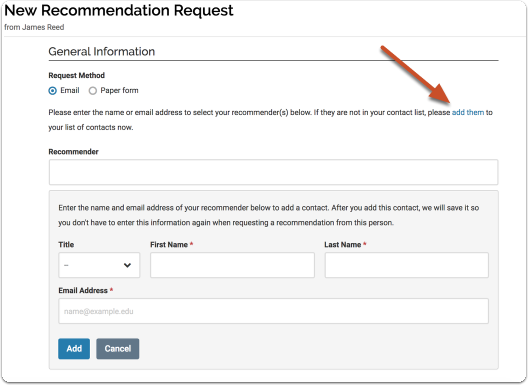 You can create and maintain a list of contacts from whom you request letters. You can use your contacts to request letters from multiple letter writers using the same letter request. 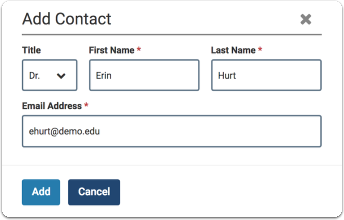 When requesting multiple letters, we will automatically generate a document title with the letter writer's name to personalize your requests. And of course, you can customize the auto-generated document title. 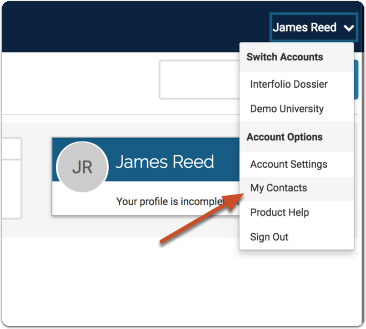 Depending on your permissions in the program, if you have a Dossier Deliver account, you can also share materials with the people in your contact list. For more information see: How to: Share and Receive Feedback on Dossier Materials. 3. Add contact information and click "Add"
Simply select "Add Them" and enter your letter writer's information. Open "My Contacts" and select "Edit" or "Delete"
To edit contacts, simply go to "My Contacts" and click the "Edit" or "Delete" link next to someones's name. If you have requested a letter from a person in your contact list, editing or deleting that person's contact information here will NOT affect your existing letter request.